You’ve likely heard most of these terms. Whether in a counseling session, social media post, sermon, small group, book, journal article, magazine blip, newspaper column, or in a plain ol conversation, you will come into contact with them. 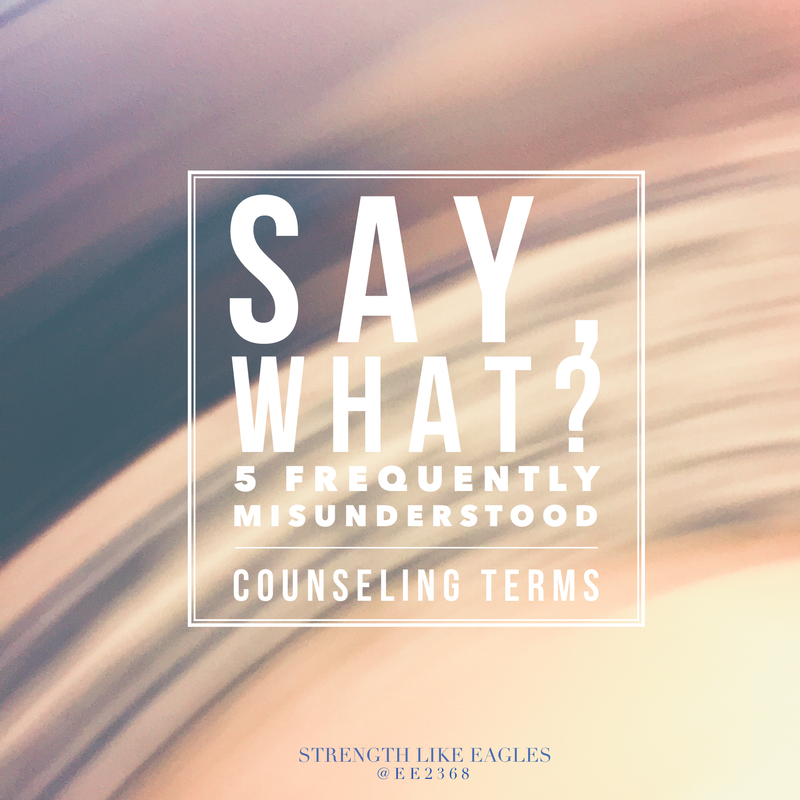 We let some of these words fly out of our mouths without understanding what they mean, and we act all touchy and awkward when we hear other terms because we fail to recognize the meaning of these terms in their context. They’re arranged in order of how annoying it is to hear them misused. Depressed: People often use this term to mean that they are really sad or that a given situation is really sad. Granted, one can experience sadness as part of depression, but sadness alone is not depression. With depression, you don’t enjoy the things that you have recently enjoyed; your energy is depleted even though you haven’t done anything to drain your energy; you either sleep too much or not enough; you notice significant changes in your appetite. If it runs in the family, you’re more likely to experience depression. It’s not simply a spiritual issue, although a healthy spiritual life can help you overcome depression. Focusing on what God says about you can help fight those feelings when you think mistakenly that you’re a total failure. Addicted: This one is bothersome. People will say that they’re addicted to chocolate, shoes, coffee, cheese, eating, shopping, or a certain brand of clothing in an attempt to say they enjoy their given “addiction” beyond what is considered normal. However, in the context in which I hear many people use the term, they don’t mean it in the sense of a true addiction, because a real addiction will destroy your life. There are two distinctions when it comes to misuse of substances: substance abuse and substance dependence. The former occurs when a person is willing put himself or herself in life-threatening situations in order to obtain or use the substance. He or she may also put the lives of other people in danger (i.e., drunk driving, leaving needles around the around the house that a toddler can easily pick up). The latter – substance dependence – occurs when a person’s body adjusts to the substance to the point where they need more of it to maintain the same effect or to where he or she has life-threatening withdrawals without the substance. Anxiety: I hear people use this term when they are referencing Paul’s admonishing to “be anxious for nothing” in Philippians 4:6-7. However, being anxious for something and having anxiety are two different things. Being anxious often is more synonymous with being impatient or worried, as if one cannot wait for a given circumstance to occur. An anxiety disorder, however, is more than mere worry, and there are actually several types of anxiety disorders. They range from specific fears (phobias) to a generalized anxiety. Most of them involve an unrelenting sense of worry despite a lack of any fear-provoking situation. Many of them involve physiological symptoms such as rapid heartbeat, shortness of breath, muscle tension, etc. In order to follow Paul’s advice, one could benefit from counseling to treat the anxiety. Codependent: Maybe people who use this term really so mean it in the true sense of the word, but let’s still look at what it means from a counseling standpoint. I hear many people use this term to describe newlyweds who are “codependent on each other,” meaning that they are so in love and both depend on each other for support. They just add the “co” to “dependent” to mean that these are two people who equally depend on each other. However, this is not what the term means in the counseling world. In the counseling world, codependent describes a person who depends on someone else’s emotional stability before he or she will make any personal decision and who has trouble setting boundaries. It is not necessarily a two-way street, and the non-codependent may or may not have expressed his or her emotions about a given situation with the codependent. If you need a good picture of someone who is codependent, just watch a Hallmark movie. Usually the lead female character is codependent. Codependency is an unhealthy type of relationship. Self-reliant: Any word with “self” in front of it automatically tends to threaten many evangelical Christians before they even take the chance to understand its context, because if you’re a Christian, you should rely on God for everything, not yourself. (Later I’ll address how certain phrases like this are misused.) One of the best ways to make sense of the prefix is to contrast it with codependency. Instead of waiting for someone’s emotional security to approve of the decisions that you have to make for yourself, you need to rely on yourself for that emotional support. Thank you for sharing such interesting and useful post!